Match of the tournament; the accolade was justified as Germany’s Dimitrij Ovtcharov overcame Nigeria’s Quadri Aruna to reserve his place in the final of the Men’s Singles event at the Seamaster 2017 ITTF World Tour Asarel Open in Panagyurishte on the evening of Saturday 19th August. The top seed, Dimitrij Ovtcharov, recovered from a three games to one deficit to beat Quadri Aruna, the no.3 seed, in seven games (11-6, 9-11, 8-11, 8-11, 11-4, 11-8, 11-6); the win coming after Kenta Matsudaira, the no.2 seed, had won the all Japanese duel beating qualifier Kenta Tazoe in five games (11-7, 11-4, 11-8, 7-11, 12-10). Dimitrij Ovtcharov, the owner of one of the most effective backhands of the modern era, Quadri Aruna with his expansive forehand; add the two together and the equation resulted in spectacular rallies that delighted the appreciative crowd. 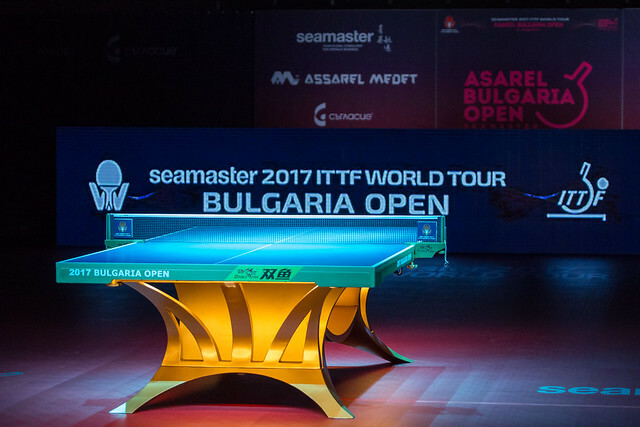 Controlling the play, Dimitrij Ovtcharov secured the opening game; Quadri Aruna replied to win a close second but did not immediately capitalise on the success. Dimitrij Ovtcharov established a 5-1 lead in the third game but chasing every ball, burning holes in his shoes, Quadri Aruna won the next four points to level matters. He went ahead 7-6 prompting Dimitrij Ovtcharov to call “Time Out”, the advantage worked but not in favour of the German. At 10-7 Quadri Aruna held three games points, the first was saved but not the second; Quadri Aruna led by two games to one. An injection of confidence, buzzing, Quadri Aruna sped into an 8-4 lead in the fourth. Dimitrij Ovtcharov reduced the arrears to one point at 8-7; now Quadri Aruna called “Time Out”. Once again the pause worked in his favour. He surrendered just one more point; a three games to one lead was established. Facing defeat, Dimitrij Ovtcharov responded, controlling the play as in the first game, the backhand top spin ever more fearsome, the German won the fifth game in style. In the sixth he raced into an 8-3 lead; Quadri Aruna reduced the deficit to one point at 8-7 and 9-8, the stage at which, following his service he was presented with a golden opportunity. A forehand top spin to follow the service, designed to win the point outright, flew long. Dimitrij Ovtcharov had a lifeline, he seized the opportunity, a deciding seventh game beckoned. Now the momentum was very much in favour of Dimitrij Ovtcharov. He won the first four points of the decider, changed ends ahead 5-3, before extending the advantage to 7-3 and at 10-6, four match points. At the first attempt the chance was taken; a place in an ITTF World Tour Men’s Singles final was claimed for the 14th time in his career. It was a contest to savour and rather overshadowed the performance of the preceding Men’s Singles semi-final; an engagement in which one Kenta took his chances and another Kenta spurned opportunities. The Kenta to spurn opportunities was Kenta Tazoe; in the opening game, he led 6-1 before losing ten of the next eleven points. A run of success, it gave Kenta Matsudaira a major injection of confidence. He dominated the second game; then he recovered from a 5-7 deficit to win the third, before Kenta Tazoe replied to secure the fourth. A possible recovery, Kenta Matsudaira doused the possibility. He won first six points of the fifth game; the “Time Out” call by Kenta Tazoe after losing the first three points having no effect. However, Kenta Tazoe, to his credit fought, as Kenta Matsudaira saw the winning post, he became tense, anxious; leading 8-6 he elected for “Time Out”. Playing freely, Kenta Tazoe levelled at 10-all but that was the end of his success. The next two points were won by Kenta Matsudaira, as in 2015 in Panagyurishte, he was once again in the final; overall the third of his career on the ITTF World Tour. Last year he won in Austria. The final of the Men’s Singles event on Sunday 20th August will conclude matters in Panagyurishte; the title deciding contest follows the Women’s Singles final scheduled to start at 3.00pm (local time).